Couples will be split into a NSW, QLD and Victoria team taking on couples from South Australia and Western Australia. They will renovate two houses every week in the upcoming series. $100,000 is on offer for the series, with host Scott Cam joined by Shelley Craft. Scottish duo Colin McAllister and Justin Ryan will step in as new judges on the series. 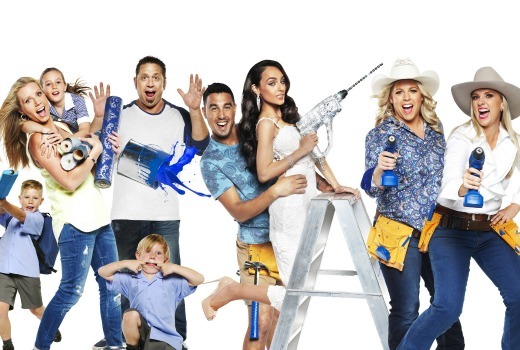 But adding to the “lookalike” template of its biggest renovation brand, Nine has released a cast photo which mirrors former styling of The Block (see below). Viewers could be forgiven for being confused about which show they are watching. Maybe that’s deliberate. The show returns soon to Nine. I love the Block, but I probably wont watch this. I dont want to get Reno Fatiged. Samereason I dont watch MKR, becasue i love Masterchef so much. All cooking reality shows, singing reality shows, renovating reality shows, dating reality shows, are all incredibly similar to each other in format and how they tell the story. I haven’t seen any reality show that is out of the box and different from anything else already out there. The Block was around before House Rules. Masterchef was around, before My Kitchen Rules. Idol was around before all those other copy cat entertainment shows came around. Reality TV is very homogeneous. But that’s what people like. So that’s why reality is still around. Same old Nine Zz let’s hope this fatigues The Block even more! But I doubt that.. 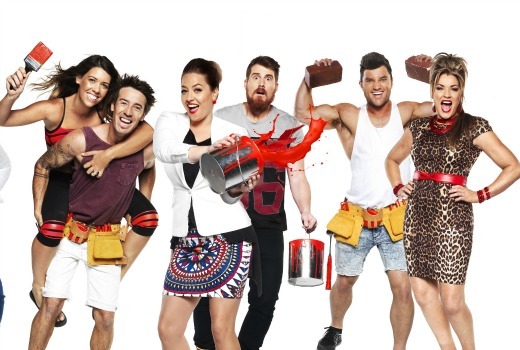 If the idea of this show is to renovate houses in one week, what is the difference between this and House Rules, sounds the same to me if so would not be surprised if channel 7 don’t complain about copy rights again, which, if Reno is using the same format as House Rules think it might another court case, will just have to wait and see. You think that nine would have learnt there lesson by now if this is the case. Nope, sorry David, can’t spot the difference. I’m wondering why the contestants aren’t from The Block or House Rules. I liked the opposing casts going up against each other. And they use teams representing states like House Rules. I won’t be watching, just over reno shows. Agreed. We don’t need three reality Reno shows this year as this is an overkill.